The Singapore Mint on Tuesday unveiled gold, silver and base-metal medallions to commemorate the upcoming summit in the neutral city between US President Donald Trump and North Korean leader Kim Jong-un. The medallions not only commemorate the “momentous step to world peace,” but also mark Singapore’s role “as a neutral host, and an economic and security gateway between the East and the West,” according to The Singapore Mint. 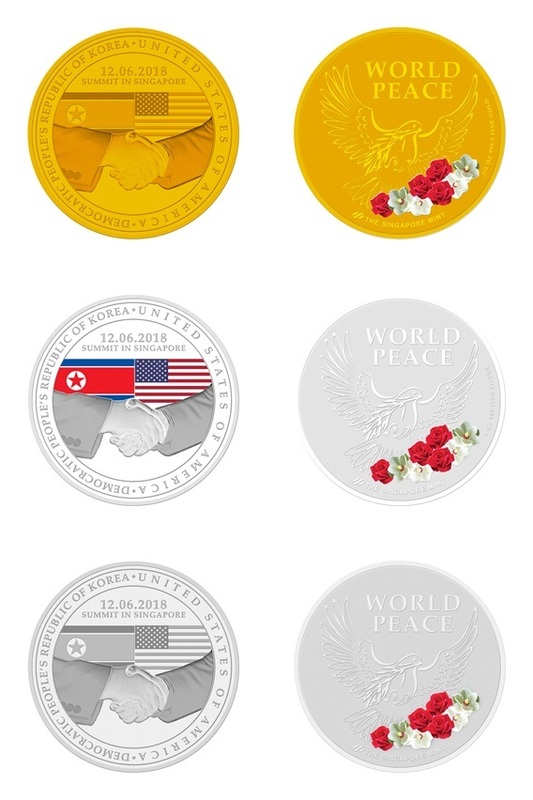 The two sides of the medallion portray a handshake between Trump and Kim with the two’s respective national flags in the backdrop, and at the back a dove with red roses and white magnolia blossoms, the two countries’ national flowers. The summit date of June 12 and the text “Summit in Singapore” are also minted at the top of the medallion. The gold medallion is priced at 1.1 million won ($1,000) and has 1,000 pieces worldwide with fewer than 200 pieces allocated to Singapore. The silver medallion which features the flags in color, is priced at 94,000 won. A total of 10,000 pieces have been minted for worldwide distribution, with fewer than 2,000 pieces allocated to Singapore. The nickel-plated medallion is priced at 28,000 won. The number of pieces to be minted will depend on the demand, Singapore Mint said. The medallions can be pre-ordered starting Tuesday at Singapore Mint’s retail outlets and website. Singapore is not alone in minting commemorative medallions. The White House unveiled their own commemorative coin for the summit, last month, which is available for purchase online at the White House gift shop website.